Now You Can Buy Microwear X2 Smartwatch For $30.29: Microwear is doing great in the smartwatch field.Now they have launched another entry-level smartwatch named as Microwear X2.It is currently available for just $30.29 which is extremely cheap if you compared it other smartwatches. 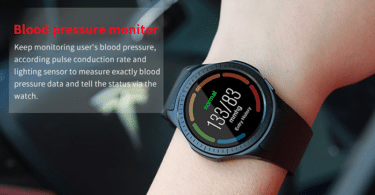 Microwear X2 smartwatch is a device that makes you live in healthier and more intelligent lifestyle.This is a perfect sports watch.Microware L1 has a bright LCD screen which should produce a great viewing experience.It has a 1.30 inch OLED Display which is great for a smartwatch.It is powered by an NRF51822 Soc which is coupled with 32 KB of RAM and 256 KB of onboard storage. 180days standby, 90days working, Waterproof level: IP68. Blood Pressure, Blood Oxygen, Dynimac Heart Rate monitor.